According to Ayurveda, a dosha is one of three bodily humors that make up one’s constitution – Vata, Pitta and Kapha. The Vata dosha influences the other doshas and governs movement in the body, the activities of the nervous system and the process of elimination. The Pitta dosha controls digestion, metabolism, and energy production, and the Kapha dosha governs the structure of the body. 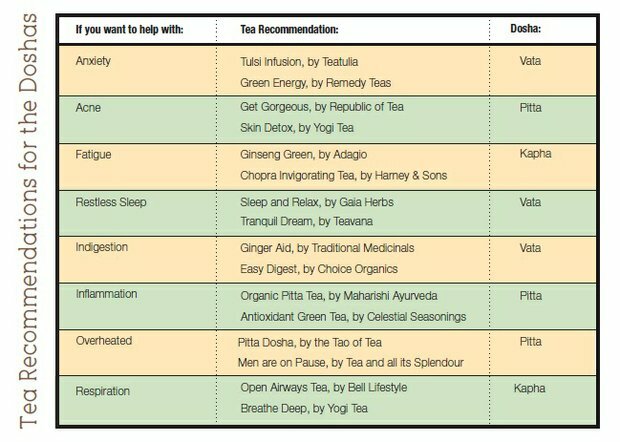 Use this chart based on the doshas to find out which teas can help with a variety of issues, such as anxiety, inflammation and fatigue.